I had gained some experiences in an “amateur” association of Hamilton Ont. Can. where in my 19thyear I made my first appearance on any stage as M’selle de Volange in “The Pride of the Market”. The Manager of the Association Mr. John Harrison of Yorkshire Eng., a portrait painter by profession and though not professionally so — an excellent actor and manager, having known me from my early childhood took great interest in my successive appearances and to his teaching is due the credit of my amateur triumphs. For my second appearance he entrusted me with “Diana Vernon” in “Rob Roy”. A month afterwards I donned the somber embodiment? of “Lady Randolph” in [John] Home’s “Tragedy of Douglas”. Then followed great predictions from Press & Public of my future achievements and the “greatness” that was in store for me! But some good came from it! For our fame having reached Toronto, a distance of 40 miles, we were invited to repeat our performance in that city for the benefit of the “Irish Famine Fund”. We gladly accepted and by our performance had the honour of aiding largely to the Fund’s benevolent purpose, afterwards repeating in Hamilton and London our performances for the same worthy cause. During the following years Charles Kemble Mason [1805-1875] came to the city and having of the successes of the association proposed to play a few “parts” with them. And to his Glenalvon I again appeared as Lady Randolph [in the Tragedy of Douglas] this being the first professional with whom I had the honour to appear. He also played The Stranger, Mr. Baker of the Association playing Dr. Haller and I the Countess. I was born in the village of Chatham, province of Quebec, Canada on the 7th of September 1830. My parents were natives of Ledbury, Herefordshire, Eng. My father belonged to the British Army and with his wife came with his regiment The Royal Staff Corps” [military engineering formed c.1800- c.1837 disbanded] – to Canada about 1822. After his “retirement” remaining in Canada, and in Octr 1837 he went with my mother and I, his only surviving child, to reside in Hamilton, Ontario. In the private schools of that city I received my education. There in Burlington Cemetery my parents are resting. I have been a widow for 26 years, having a son and daughter, both happily married. Her family was in no way concerned with the theatre, and she passed her girlhood in an environment that would seem to offer small opportunity for the development of dramatic talent. (EJ Phillips obituary 1904) However, the amateurs of Hamilton seem to have been somewhat more progressive than theatre in Toronto, as Mrs. Malaprop was being played by a man with a beard there, while Hamilton had actresses such as EJ Phillips playing that role. EJ Phillips [Nickinson] The following was written in the last years of her life for her family. Elizabeth Jane Phillips, born Sept 7th 1830 in Chatham, Province of Quebec, Canada, daughter of Thomas Phillips, by his wife Elizabeth (Williams) Phillips. Mr. and Mrs. Phillips were born in Ledbury, Herefordshire England. Thomas was apprenticed and “served his time” to the trade of carpenter and joiner. He then enlisted in the army. During the reigns of George the 3rd [1760- 1762] and 4th [1820-1830] and William the 4th [1830-1837, Victoria became Queen in 1837 ], he served in the regiment called the Royal Staff[ordshire] Corps., composed of mechanics and artisans. The regiment was ordered to Canada about 1820 and stationed in Quebec, thence to Montreal and later to Chatham. In the meantime the Regt was ordered back to England where it was placed on recruiting duty in all the principal cities and towns of England. Then the Regt returned to Canada and he [Thomas Phillips] remained a loyal subject to Great Britain, receiving his discharge from the British Army and one hundred acres of government land for his services in the army. Barbie Dolman Spencer wrote that Thomas Phillips stayed to work on the Rideau and Ottawa Canals. Rideau Canal Waterway http://www.rideau-info.com/canal/ Arguably the most scenic waterway in North America. Links the lakes and rivers between Ottawa and Kingston, is the oldest continuously operated canal in North America. The locks are operated today much as they were when first opened in 1832. Father worked at his trade until December when a call was made for volunteers to go to the front and on Christmas morning 1837 Father enlisted in the militia of Hamilton and was sent to Navy Island to oppose the “McKenzie Rebellion” -- remained with the volunteers while the trouble lasted, then opened a tavern and boarding house on James Street Hamilton, where we lived until 1843 -- when Father, having purchased two city lots on South James Street near Burlington Bay, built a house on the grounds and we lived there. There Father and Mother ended their days, she on the 15th of Septr 1852 and he on the 1st of April 1863. They had only two children. Mary Ann born Sept 1824 and Elizabeth J. born Septr 7th 1830. Mary Ann passed away in Octr 1832 in the 8th year of her age of croup. EJP refers several times to her grandsons' education, but never to her own. She was obviously intelligent and articulate. She was clearly a newspaper reader and periodically refers to contemporary books and journals. She appeared in a number of classic plays by Shakespeare (and others) and knew avant garde modern plays through AM Palmer's companies. In the meantime I had received several offers of employment from professional companies and at last accepted one from Messrs Besnard & Nickinson to open the season in Toronto, Ont on Easter Monday 1852 at the Royal Lyceum Theatre. And here, and at that date I began my career on the stage, which lasted forty-five years, through the United States and Canada. Edwin Forrest (1806- 1872) is mentioned in EJ Phillips' New York Dramatic Mirror obituary as someone she had acted with. We have a review from an unidentified newspaper of a performance at the Metropolitan Theatre [probably Hamilton, Ontario, Canada] of his performance in Othello where "Miss Phillips' Emelia was hardly inferior, if at all, to Iago and her last scene was striking. late 1850s? In my hurry in writing you a day or two before I was taken sick, I omitted answering your question about Mr. McIntosh as to whether he was the same man who was in the "casts" in the programme. Yes! he was a very clever Amateur and often obliged your father by playing parts when he was short of actors whom he could trust. I had known him in Hamilton [Canada] long before. He belonged to the Amateur Company that I first played with there. I made my first appearance on any stage as "Mam'selle DeBolange" in The Pride of the Market, whether Mr. McIntosh was in the cast or not I do not remember, but in my second appearance a few weeks later he was "The Dougal" creature and I was "Diana Vernon" in Rob Roy. Then a few weeks after that we both appeared in the Tragedy of "Douglas. Mr. McIntosh was "Young Norval" and I as his Mother, "Lady Randolph". I cannot give you the exact date of these appearances, but I think it was in the Fall of 1848. I had passed my 18th birthday. Toronto theatre historian Mary Shortt speculated in a Nov 1978 letter that EJ Phillips may well have appeared in the very first plays performed at the Royal Lyceum, as the cast on January 16, 1849, opening night of its first dramatic season, was composed of amateurs from Toronto and Hamilton. No names were given for the amateurs taking part, but it was announced that "two of the Leading Actresses" of the Hamilton Theatrical Society were to appear. On May 17, 1849, a benefit was given at the Royal Lyceum for the family of a fire victim, and this time "two of the Principal Ladies' of the Amateur Theatrical Society of Hamilton are identified as Mrs. Baker and Miss Phillips. On the following June 6 and 8, EJ Phillips and several other amateurs supported Charles Kemble Mason, a nephew of Mrs. Siddons and cousin of Fanny Kemble in THE HONEY MOON and THE STRANGER. On June 11, EJ Phillips played Lady Randolph to Mason's Glanalvon in DOUGLAS, and was commended by a local paper for "a very neat and ladylike piece of acting." On Easter Monday, 1851, John and Charlotte Nickinson, who were touring together, made their first appearance on the Toronto stage, and immediately became favorites. During the following months, they and a succession of other peripatetic professionals temporarily ousted the amateurs from the Royal Lyceum. Buffalo, Oct. 3rd, 1890 Yesterday I took a run over to Hamilton, Ontario [Canada, where her parents were buried] to see about the condition of the cemetery lot. I found it in very good state after an absence of 15 years, but my old friend, Mrs. Mallett was gone, having died in 1884 & her husband in 1883. I found one of his daughters and had a chat with her, and that is the only person I met whom I had ever seen before. Made me feel rather sad. Thomas Phillips as born in Ledbury, Herefordshire, England Jan. 1794 and died April 1, 1863. Mrs. Phillips was born July 1, 1790 also in Ledbury and died Sept. 15, 1853. Mary Glen had a meeting in Toronto in June 2005 and thought we had specific enough information to find Mr. and Mrs. Thomas Phillips in the "Burlington Cemetery Lot 19, Christ Church division", until I stopped in the Burlington Visitor Center, north of Hamilton and found there were several possibilities. They suggested I check out a small cemetery "just follow the signs to Ikea". 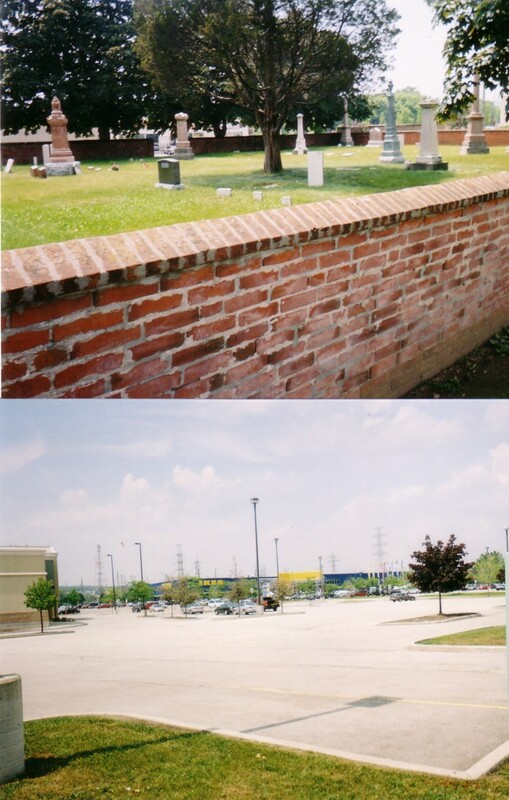 This small shaded cemetery was charming, but the gate was locked and I decided against trying to climb over the brick wall. I did talk to people at the Hamilton Public Library, who had some indexes to the Hamilton Cemetery at 777 York Boulevard, which seems likely to be the correct one. 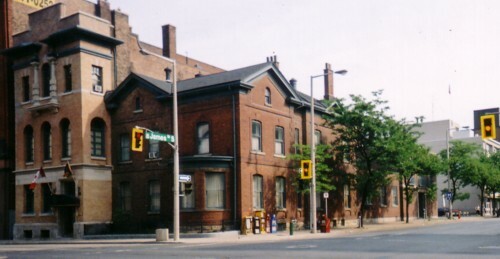 The Library is adjacent to the Hamilton Farmer's Market originally founded in 1837, at the corner of York & James Streets ... 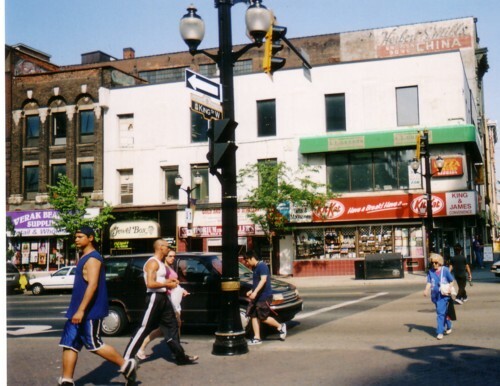 The Market has been in its current location, 55 York Blvd. since August 1980. https://hamiltonfarmersmarket.ca/ I doubt that EJ Phillips bought bagels or spanokopita as I did at the Hamilton Farmer's Market, but I expect she knew the original one. Cole's Bookstore had a good selection of local books on Hamilton. Benson, Eugene and LW Connolly, editors, Oxford Companion to the Canadian Theatre, Don Mills: Oxford University Press, 1989.